This page shows two photographs of a five hole probe. The probe is used for diagnostic wind tunnel testing and in flight testing to determine the flow direction or angularity. At the upper left of the figure, we show a picture of the probe itself. The probe is a bundle of five tubes; a center tube surrounded by four tubes in the shape of a cross. The leading edge of the four outside tubes are cut at a 45 degree angle to the center tube. We can determine the form of the function by calibrating the probe. A calibration rig is shown in the picture at the upper right of figure. Axial flow is generated by the flow nozzle. 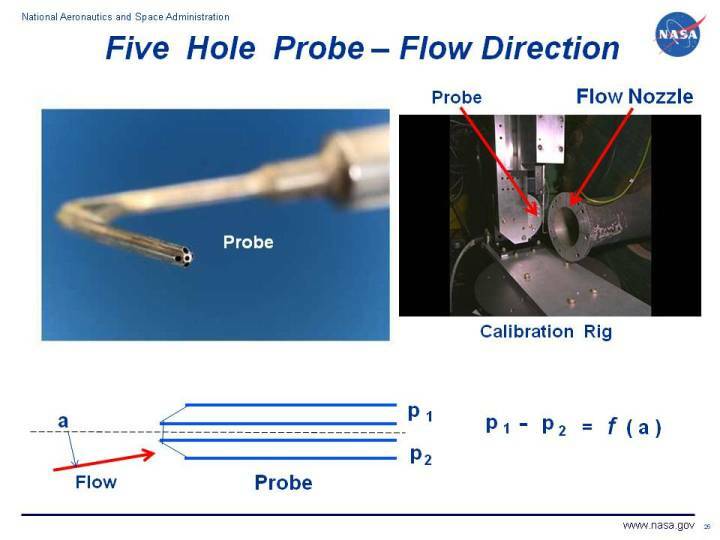 The probe is inserted into the flow and the angle that the probe makes with the flow is varied during the calibration test. A mathematical calibration curve is then generated for the measured difference in pressure as a function of the measured angle. The diagram at the left shows a vertical cut through three of the tubes. The angle of the flow a is then related to the angle of attack of an aircraft. A similar horizontal cut can be made through the two remaining tubes and the angle of the flow is then related to the yaw angle of an aircraft. A five hole probe can therefore be used to simultaneously provide both pitch and yaw information in a flight test, or to provide the flow angularity in two perpendicular planes in a wind tunnel test. There are three hole probes that can also be used if we are only interested in the flow deflection in one direction. During a wind tunnel or flight test, the probe is inserted into the flow and aligned relative to some part of the tunnel or aircraft. Using the measurements from the five tubes and the calibration curves, we can determine the deflection of the flow in two perpendicular planes relative to the wind tunnel or aircraft part. In some applications, the probe may be moved through the flow field to develop a complete map of the flow angularity. But in most applications, the probe remains fixed to the tunnel wall, model, or flight vehicle.